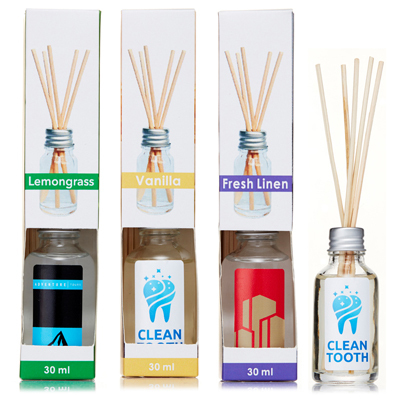 Reed Diffusers are great for us at the office or at home. Pleasant scents enhance any space and provide �personality� to a room or office. Unlike candles, reed diffusers are flame free and do not require any heat. The fragrance oils are absorbed up through the willow reeds and the scent is dispersed naturally through evaporation. Higher temperatures will increase the speed of evaporation, but most diffusers will last 3-4 weeks in most temperature-controlled environments. Scents are best experienced as you walk by a diffuser, and work well placed towards the entrance of a room.